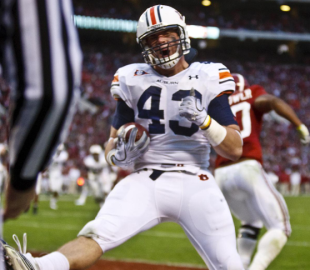 Philip Lutzenkirchen’s two catches against Ole Miss were his last as an Auburn Tiger. Please pause for a moment of silence. While meeting with the press after today’s loss against Vandy, which Lutzenkirchen sat out due to a hip injury, Gene Chizik said that the star Auburn tight end was done for the season. Chizik didn’t elaborate on the injury. Lutzenkirchen did. We’ll always have the Lutzie. Thank you, Philip. You were a one-of-a-kind gem and will always be one of the great ones. We love you, Lutz. Thanks for everything. So proud to have you representing Auburn. Great AU player and man. What a sad day for him and AU. Hopefully he can recover and have a nice pro career. Thanks for all you did for Auburn, you will be a forever favorite. Best of luck in your next ventures.